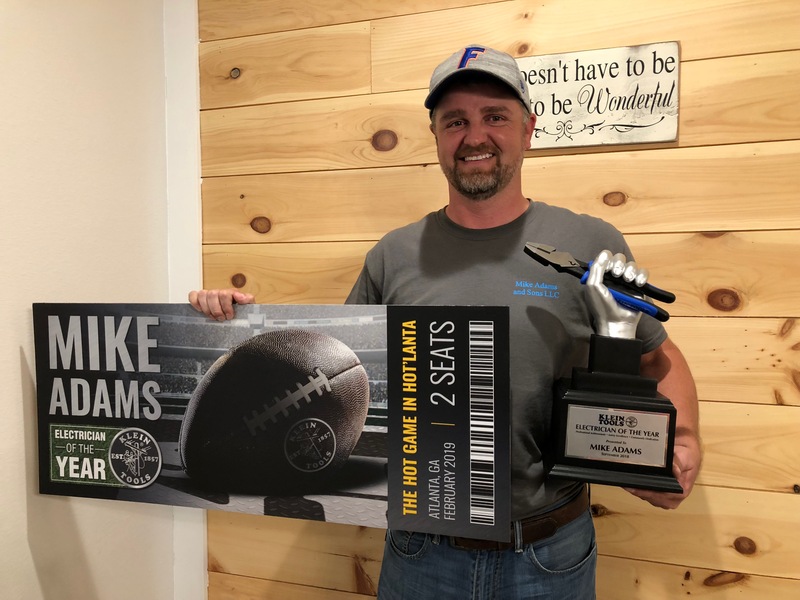 Sept. 21, 2018 (Lincolnshire, Ill.) – Klein Tools today announced Mike Adams as the winner of its annual Electrician of the Year award. As the 2018 grand prize winner, yesterday Adams was presented with tickets to the Big Game in February 2019, which includes a special VIP experience for him and a guest. He will also receive a one-time order of $1,500 in premium-quality, professional-grade Klein Tools products. A resident of Jay, Florida, Adams is a fourth-generation electrician, having learned the tricks of the trade from his great-grandfather, grandfather, father, uncles and even his mother. Throughout his career, he has worked on a variety of jobsites, including Air Force bases, casinos and helping local farmers. Adams is passionate about sharing his knowledge of the trade and safety standards to the next generation. For the past six years, he has taught the electricity program at Locklin Technical College in Milton, Florida. When not teaching in a formal classroom, Adams advocates for safety as an authorized OSHA instructor, where he instructs students, employees and community members on OSHA standards and ways to stay safe while on the job. Members of the Klein family, with help from a screening panel and thousands of fan votes, ultimately selected Adams from hundreds of applicants for his outstanding professional achievement, dedication to safety and contributions to his local community. Part of what made him an outstanding candidate was his commitment to teaching the next generation to be safe and knowledgeable tradespeople. Klein Tools also congratulates the 2018 Electrician of the Year runners-up: Steve Heryford, John Spier, Dave Elliott, Patrick Schwent and Tom Johnson. All finalists received the Ultimate Garage Package, which includes an 18-piece Journeyman™ Tool Set and other Klein Tools products. The regional winners also received a trip to tour Klein Tools’ manufacturing headquarters in Mansfield, Texas to see where the premium-quality products are made. More information on the Electrician of the Year award and all winners, please visit www.kleintools.com/eoy.